Quayside Winding Hole is a minor waterways place minor waterways place place on the waterways major waterways place village town city on the Leeds and Liverpool Canal (Leigh Branch) between Bridgewater Bridge Winding Hole (1¼ furlongs to the east) and Plank Lane Bridge No 8 (Lift Bridge and site of former Colliery) (1 mile and 5¾ furlongs to the west). 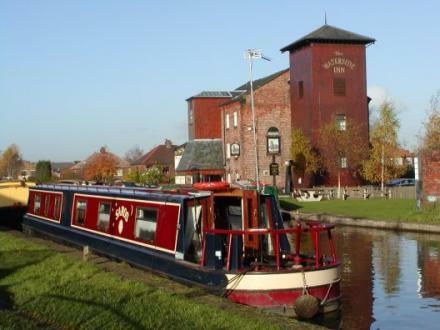 The nearest place in the direction of Bridgewater Bridge Winding Hole is Leigh Bridge No 11 (Junction of the Bridgewater Canal (Stretford and Leigh Branch) and the Leeds and Liverpool Canal (Leigh Branch). ); ¾ furlongs away. The nearest place in the direction of Plank Lane Bridge No 8 is Leigh Pipe Bridge; 2½ furlongs away. The place is a Pub and a Restaurant. 42 - 44 St Helens Road, Leigh, WN7 4HW — 203 yards to the south. Leigh — 499 yards to the northeast. 20 St Helens Road, Leigh, WN7 4HW — 148 yards to the southeast. 34 king st, Leigh, WN7 4LR — 261 yards to the northeast. 20a Leigh Road, Leigh, WN7 1 — 674 yards to the north. Jury Street, Leigh, WN7 5RX — 1486 yards to the north. Leigh, WN74A — 409 yards to the northeast. Sodality Hall, Mather Lane, Leigh, WN7 2PR — 908 yards to the east. 198 Leigh Road, Leigh, WN7 1SH — 1365 yards to the north. 62 Kirkhall Lane, Leigh, WN7 1SA — 1247 yards to the north. Pennington Flash Country Park, Off St Helens Road, Leigh, WN7 3PA — 1471 yards to the southwest. 148 St. Helens Rd, Leigh, WN7 3 — 913 yards to the south. 25 chapel street, Leigh, WN72PB — 828 yards to the east. 56 King Street, Leigh, WN7 4LJ — 174 yards to the northeast. Leigh — 1387 yards to the east. 7 King Street, Leigh, WN7 4LP — 330 yards to the northeast. 33 King Street, Leigh, WN7 4LP — 230 yards to the northeast. Sale Way, Leigh, WN74 — 810 yards to the southwest. 81 MESNES AVENUE, Leigh, WN35TL — 1433 yards to the south. 75 North Lane, Manchester, United Kingdom, M29 7AB — 1522 yards to the east. Unit 1, The Loom, Leigh, WN7 4BA — 499 yards to the east. Leigh — 114 yards to the south. 1k brown street north, Leigh, WN71BU — 735 yards to the northeast. Leigh — 411 yards to the northeast. 54A Leigh Road,, Leigh — 759 yards to the north. Unit 5 Butts court Industrial Estate Butts street, Leigh, WN73AW — 276 yards to the northwest. Leigh — 903 yards to the southwest. 41 King Street,, Leigh, WN7 4LL — 214 yards to the northeast. Unit 4 Victoria Industrial Estate Victoria Street, Leigh, WN7 5SE — 1296 yards to the north. 57-59 Leigh Rd, Leigh, WN7 1QZ — 942 yards to the north. 198 CHARLES STREET, Leigh, WN7 1PT — 1365 yards to the northeast. The Loom, Derby Street,, Leigh, WN7 4 — 488 yards to the east. 105 Chapel Street, Leigh, WN7 2DA — 1156 yards to the east. The Ave, Wigan, WN71 — 1439 yards to the northeast. Holden road leigh, Leigh, WN71EX — 31 yards to the northeast. Turnpike Centre, Civic Square, Leigh, WN7 1 — 478 yards to the north. 6-8 Twist Lane, Leigh, WN7 4DA — 199 yards to the northeast. 61 Ellesmere St, Leigh, WN7 4LQ — 244 yards to the east. Leigh — 1490 yards to the northeast. Leigh Sports Village Stadium Sale Way, Leigh, WN7 4JY — 819 yards to the southwest. LEIGH RETAIL & LEISURE PARK,Spinning Jenny Way, Leigh, WN7 4PE — 588 yards to the east. King St., Leigh, WN7 4 — 312 yards to the northeast. Parsonage Retail Park, Leigh WN7 5SJ, Leigh, WN7 5SJ — 801 yards to the northwest. 217C Wigan Road, Leigh, WN7 5 — 1564 yards to the northwest. 147 Firs Lane, Leigh, WN74SU — 1288 yards to the west.